Former US president Barack Obama paid a visit to his extended family in Kenya Monday, on his first trip to the country since 2015 during which he will open a youth centre. Obama arrived in his father's native Kenya on Sunday, where he paid courtesy calls on President Uhuru Kenyatta and main opposition leader Raila Odinga. On Monday he flew to the west of the country, where under extremely tight security he paid a visit to the home of his step-grandmother Sarah Obama in the village of Kogelo, an AFP reporter said. He was expected to meet a number of members of his extended family, before launching the Sauti Kuu (Swahili for "Strong Voices") centre set up by his half-sister Auma Obama. Addressing the media last week, Auma said the state-of-the-art centre would give local youth access to books, internet and sporting activities. They will also be able to benefit from classes on work ethics, civic education, environmental conservation and financial literacy. The centre includes an international standard size football pitch sponsored by the German ministry of development cooperation, a basketball court funded by the Giants of Africa Foundation, and a volleyball/netball court and other facilities, including a library and IT lab. The centre is set to also offer adult education. 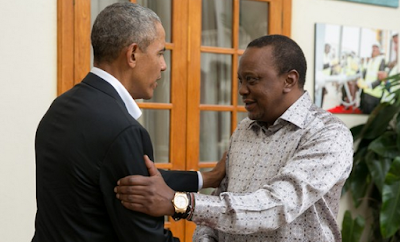 When Obama visited Kenya in 2015, he was unable to visit his father's village due to security concerns, and vowed to return when he was no longer "wearing a suit" and contribute to the development of young people. After his visit to Kenya, Obama will fly to South Africa where he will deliver the annual Nelson Mandela lecture.